It sounds bizarre – but we may soon be able to treat certain cancers by merely smelling a particular scent. Studies now show that certain odors may inhibit cancer, while others may actually promote the disease. And this research is revealing intriguing characteristics of cancer that scientists never suspected till now. . . Consider the fact that a study in Germany demonstrates how scents from essential oils may affect cancer and other health conditions. There’s never been any doubt that essential oils possess potent biological properties. The German researchers note that plants create these substances to protect themselves from bacteria, viruses and fungi. In plants — and in our bodies — terpenes can set off what are called “signalling” processes in cells, processes that change cells’ activities. They do this by interacting with olfactory receptors. Now, in our bodies, olfactory receptors are mainly found in the nose – as you might guess — where they are activated when smells waft into our nasal passages. They help us identify odors. But here’s something that was news to me: olfactory receptors are found in other parts of the body besides the nose. Receptors of this type occur in a wide range of organs including the prostate gland, the skin and even in sperm. Consequently, the terpenes from essential oils can influence what happens in any organ that contains olfactory receptors. Plus, researchers have found that terpenes influence the development and spread of cancer. When the German researchers tested eleven terpenes found in essential oils they found that two of them could potentially slow the growth of liver cancer cells. The most intriguing of these two was citronellal, which is contained in citrus essential oil. 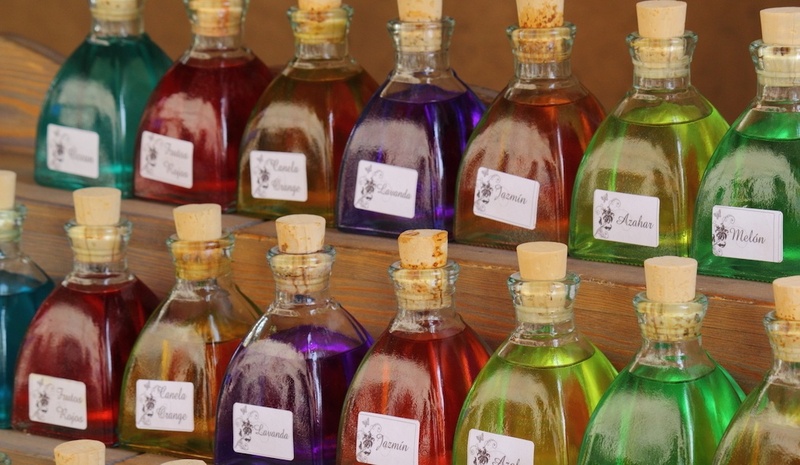 Other essential oils have the potential to protect the lungs and liver from the carcinogenic effects of air pollution, according to research in France. These tests show that essential oil compounds can limit the inflammatory – and potentially cancer-causing – results of inhaling the dirty particles in the air of most urban areas. The French scientists discovered that these compounds could reduce inflammatory chemicals released by immune cells by up to 96 percent. “The findings provide the first evidence that natural essential oil components counteract the inflammatory effects of particulate matter, such as that contained in polluted air,” says researcher Miriana Kfoury. Sandalwood, a popular scent, is another essential oil that can protect against inflammation. A study in Europe shows that skin cells have olfactory receptors that connect to the molecules conveying the sandalwood scent. When these receptors are activated, they speed the rate of wound healing. However, while essential oils may be beneficial in the fight against cancer, certain other odors, say researchers at University of Southern California, may be dangerous for women with breast and ovarian cancer. Lab tests show that in women who have a genetic predisposition to breast cancer and ovarian cancer, certain odors encountered during menstruation may stimulate the development of tumors. It’s possible that these women, who have what’s called the BRCA1 gene mutation, may have a sharper sense of smell. Professor Dubeau believes that it may be possible to develop treatments for cancer that are based on smell. But more research needs to be done to better understand exactly how smell affects the growth of cancer. “We’ve known for a long time that smell receptors are expressed in all kinds of tissues, but we know very little about what these receptors do outside of the nose,” Prof. Dubeau says. We’ve written in previous issues that cancer cells themselves give off scents that can be used to diagnose the presence of cancer. It’s pretty evident that the odors given off by cancers and other diseases will soon be diagnostic tools. And I just came across a report that researchers in Japan are developing a breath analyzer to test people for lung cancer.9 As soon as more findings are reported and the technology advances, I’ll be sure to let you know.